The coolest thing about writing these virtual columns is that you meet a lot of interesting people, mainly through emails but also face-to-face. After all, people with a specific knowledge of whatever you happen to write about often end up reading, and reacting to, something you happen to write about (especially if you make a factual mistake). It is simply astonishing sometimes who reads this stuff. And there was an oddly passionate reaction to a years-ahead-of-its-time-even-if-I-say-so-myself column (Goodbye, Ruby Tuesday), both pro and con, from waiters and waitresses of that place for years. But columns don't have to generate comments to prove they're still being read. Some things appear on the Google Blogger page view statistics that I forgot I wrote. And I've noticed recently that for reasons beyond my comprehension, a piece from the depths of the financial crisis has consistently generated page views. Why, I don't know, but since it was one of my favorites, I thought I'd reprint it here. The New-New Gettysburg Address popped into my head when the Feds mind-blogglingly agreed to bail out the holders of credit default swaps written by AIG at 100 cents on the dollar, at a time when the holders of those credit default swaps, which included Goldman Sachs, would probably have given their first-born children for 50 cents on the dollar. Oh, and the Average Joe was not getting bailed out of anything, least of all the 120% loan-to-value no-doc mortgage he'd been talked into taking out by one of the many scummy mortgage brokers whose short-sighted, commission-based incentive to close bad deals was the one real driver of the subprime crisis Congress never got around to blaming. The column took probably took 15 minutes to write, and another hour to polish. And three-plus years later it still appears on the stats of what people are reading. But, in a larger sense, we can not dedicate -- we can not consecrate -- we can not hallow -- this ground. The brave men, living and dead, who struggled here, have consecrated it, far above our poor power to add or detract. The world will little note, nor long remember what we say here, but it can never forget what they did here. It is for us the living, rather, to be dedicated here to the unfinished work which they who fought here have thus far so nobly advanced. It is rather for us to be here dedicated to the great task remaining before us -- that from these honored dead we take increased devotion to that cause for which they gave the last full measure of devotion -- that we here highly resolve that these dead shall not have died in vain -- that this nation, under God, shall have a new birth of freedom -- and that government of the people, by the people, for the people, shall not perish from the earth. Four or five years ago our Investment Bankers helped bring forth on this continent, and around the world, a new banking system, conceived in Leverage, and dedicated to the proposition that all persons working for Investment Banks can create enormous Wealth for themselves with almost no Risk except to Taxpayers. Now we the Investment Bankers of Goldman Sachs are engaged in a great Scam, testing whether that Nation of Bankers can get paid without Tipping Off the Taxpayers to that Scam. We have come to cash our checks. It is altogether fitting and proper that we should do this, for we have Houses in the Hamptons requiring upkeep. But, in a check-clearing sense, we can not Cash Our Checks so long as AIG cannot make good on the credit default swaps we purchased to Hedge our Leverage. Thankfully, the brave men of Goldman who struggled to Attain Positions of Power in Treasury and the White House have consecrated it, far above Barney Frank’s poor power to detract from our AIG Contracts. The Small Investor will little note, nor long remember, how completely screwed He got, but we the Investment Bank of Goldman Sachs can never forget what they did to provide us this cash. We thank them for the $8 billion Their Government is paying to AIG in order to Make Us Whole. We here highly resolve that The Little Investor shall not have died in vain -- that this nation, under Goldman Sachs, shall have a new birth of Leverage Without Risk -- and that government of Goldman, by Goldman, and for Goldman, shall not perish from the earth. The content contained in this blog represents the opinions of Mr. Matthews. Mr. Matthews also acts as an advisor and clients advised by Mr. Matthews may hold either long or short positions in securities of various companies discussed in the blog based upon Mr. Matthews’ recommendations. This commentary in no way constitutes investment advice. It should never be relied on in making an investment decision, ever. Nor are these comments meant to be a solicitation of business in any way: such inquiries will not be responded to. This content is intended solely for the entertainment of the reader, and the author. Jeff is wrong, slightly, as the didn't get 100.0 cents on the dollar. But it was pretty close. The columns are still being read because they still ring true. I don't always agree with your point of view, but what you write is well thought through and mostly self consistent. And it is brutally honest, whether you kick the investment banks or whether you defend them. And whether you call congress stupid, moronic, clueless, greedy, or just simply pompous self righteous liars. It simply all rings true. Dude! How about a link to those older columns that you mentioned - that would be great. Thanks! Anonymous: the people who buy the securities are the ones who should take the risk of owning it, not the taxpayer. The AIG claims should have been payed off at the lowest rate that would keep the system together, or emergency loans provided instead. Dude! Links provided, thanks for the prompt... D'oh! One of my favorite as well. It must in part age well as it was true then, and IT IS STILL TRUE!! Shocking, absolutely shocking the level of regulatory capture - and you have captured that well, with the Gettysburg device. "Secrets in Plain Sight: Business and Investing Secrets of Warren Buffett." Now at Amazon.com. -Bethany McLean, author, "The Smartest Guys In The Room." 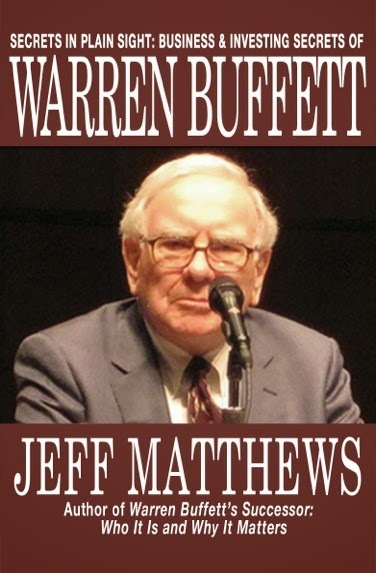 "Secrets in Plain Sight: Business and Investing Secrets of Warren Buffett"